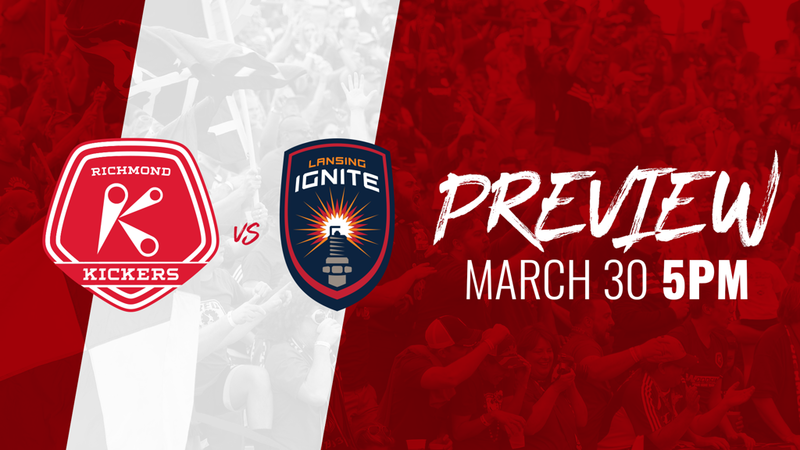 RICHMOND, Va. – (Friday, March 29, 2019) – The Richmond Kickers will open their 27th professional season this Saturday night at 5:00 p.m. as they host Lansing Ignite FC in their first-ever match, presented by Woodfin. This match will mark the start of the 2019 USL League One season. The party starts when the gates open at 3:30 p.m. with live music from the VCU Peppas and craft beer on tap with specials right when the gates open! The Kickers take the field at 5:00 p.m. to face Lansing. The first 1,000 fans through gates will receive a 2019 schedule magnet, courtesy of WTVR CBS 6. Catch this match streaming online through ESPN+ and on the Kickers Official Television partners WTVR CBS 6. Tickets are available now at RichmondKickers.com. Saturday’s match will be the first-ever meeting between the two clubs, with Lansing fielding a team for the first time. The Kickers were announced as a founding member of USL League One in September 2018, joining nine other clubs for the league’s inaugural season: Chattanooga Red Wolves SC, FC Tucson, Forward Madison, Greenville Triumph SC, North Texas SC, Orlando City B, South Georgia Tormenta FC, Toronto FC II and Saturday’s opponent, Lansing Ignite FC. Richmond will have a new look for the 2019 season, following an ownership change that saw 22 Holdings, LLC purchase the pro team. With David Bulow returning at the helm for his first full season in charge of the Kickers, the Kickers only return five players from the 2018 squad, which includes Greg Boehme, Matt Bolduc, Conor Shanosky, Scott Thomsen and Braeden Troyer. Bulow made it a point to bring in USL Championship calibre talent, adding veteran players such as Dennis Chin, Akira Fitzgerald and Daniel Jackson. Heading into their first-ever match, Lansing finished their preseason with a record of 3-1-0 behind head coach Nate Miller. Haitian youth international Steeve Saint-Duc lead the way for LIFC in scoring during preseason with four goals. LIFC announced this week that former Charlotte Independence and Des Moines Menace defender Brandon Fricke will be the first captain for the new club. The Kickers will be back in action next Saturday night, April 6 to host South Georgia Tormenta FC for a 5:00 p.m. kickoff. It’s College Night at City Stadium, with students getting tickets for just $10 at the gate with a valid student ID. Tickets for this match are on sale right now at RichmondKickers.com. Richmond: Forward Daniel Jackson (#9) is set to lead the Kickers attack Saturday night after joining the Kickers over the off season. The Pittsburgh native returns to the U.S. after a stint in Finland with Bollklubben-46. Goalkeeper Akira Fitzgerald (#1) brings veteran leadership to the Kickers defense. The Wake Forest product brings in a wealth of USL Championship experience split between North Carolina FC and the Tampa Bay Rowdies. Returning to the Kickers backline for 2019, defender Conor Shanosky (#5) will play in his fifth season in Richmond. Over the last two seasons, Shanosky has made 42 appearances, starting in 38 matches and scoring one goal and notching an assist. Lansing: Coming off an international match with the Trinidad and Tobago national team taking on Wales, midfielder Nathan Lewis (#27) joins Lansing for the start of the USL League One season. Lewis comes to Lansing following 11 appearances for USL Championship side Indy Eleven in 2018. Defender Nick Moon (#14) impressed at a closed-door tryout in January, earning himself a professional contract with Lansing. A product of the University of Wisconsin-Milwaukee, Moon scored 13 goals and notched 12 assists over 71 appearances during his four-year collegiate career. Forward Steeve Saint-Duc (#11) brings his Haitian youth national team experience to the Ignite for the USL League One Season. He most recently featured for the Haiti U20 national team during the 2018 CONCACAF U20 Championship in November.